Soc Trang is located in Mekong Delta, surrounded by Vinh Long, Tra Vinh, Bac Lieu, Hau Giang, and East Sea. Pagoda is the highlight in this province that is mainly constructed under the influence of Khmer culture. Thus, tourists should not skip the chance to visit the famous pagodas in Soc Trang on a trip to this province. Influenced by oceanic weather, Soc Trang has two seasons: the dry season typically starts from December to April next year and the rainy season starts from May to November. Average annual rainfall is 1,840mm. Average yearly temperature is 27oC. You can visit Soc Trang all year round. But the best time to visit this province is in the dry season to stay away from unexpected rains. Soc Trang is home to multiple ancient pagodas such as Đất Sét (clay), Dơi (Bat), Chén Kiểu (Porcelain bowl) and Ông Bổn with typical architectural features of Khmer ethnic people. Bat pagoda is located on Van Ngoc Chinh Street (with a signboard) in Ward 3, Soc Trang city. The pagoda is the most famous pagoda in Soc Trang which is a Khmer-style Pagoda constructed around the 16th century, about 4km from Soc Trang city. It is the only Khmer pagoda worshipping Shakyamuni Buddha in Soc Trang. It presents Khmer arts, with symbolic, skillful decorations on its roof and pillars and splendid statues and relieves. It is well-known for its beautiful architecture as well as its very large roof housing tens of thousands of bats. The bats leave Doi Pagoda at night to look for their food and return early next day. They don’t eat fruits within the area of the pagoda. The pagoda is an overall architecture including the Main Hall, Sala, living room, the tower to put ashes of the dead, bedrooms, and the synagogue of monks & believers, etc. All situated on a large campus with lots of old trees, an area of around 4 hectares. The best time for visiting this pagoda is early morning and about 30 minutes before sunset, when the bats are most active. Around dusk, many bats swoop out from the trees to go hunting for food. Bôtum Vong Sa Som Rong or Som Rong pagoda was built over 600 years ago. The first Som Rong pagoda was erected with bamboo and wood which was covered with simple leaves. The pagoda has many Som Rong trees that grow on their own, so the pagoda took the name of Som Rong to name. 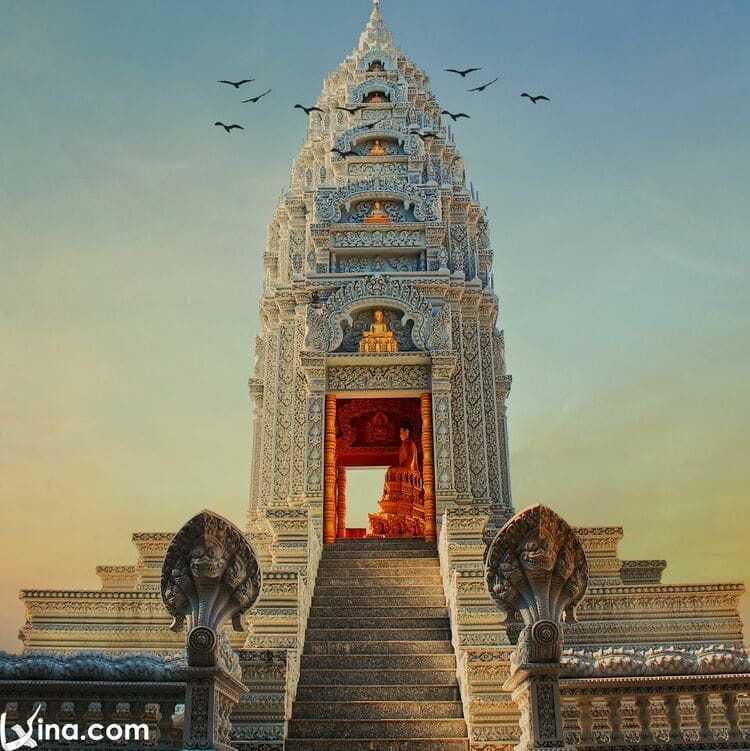 The pagoda is redolent of the ancient Khmer temple architecture with sophisticated sculpture. 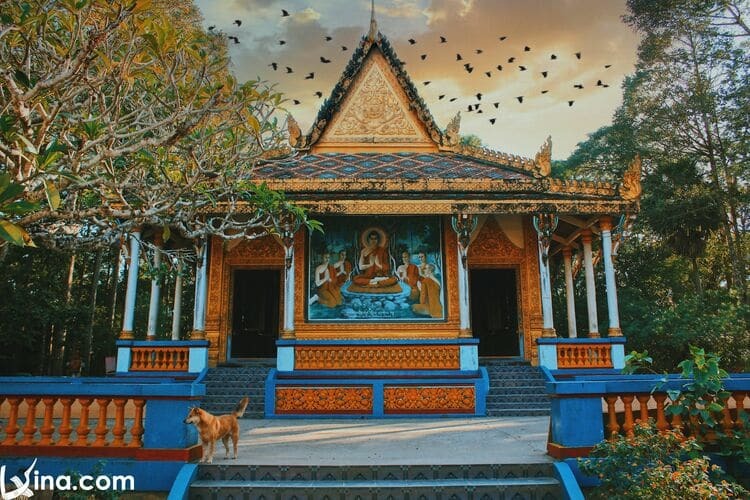 In the afternoon, Som Rong pagoda is more and more poetic with the sunset scenery and the pigeons flying in the blue sky to make the sight here peaceful. Chen Kieu pagoda is located on Highway 1A at Dai Tam Commune, My Xuyen District, just 10 kilometers from Soc Trang Town. The temple was acknowledged as a national cultural relic in 2012. The pagoda has the unique architectures when all columns and wall surfaces for both the interior and exterior are stunningly decorated with about 30 tons of broken porcelain pieces involving vases, bowls, and plates. The sanctum contains 16 pillars carved with icons of the legends of the Khmer culture. The gate is decorated with two huge stone lion statues. Ông Bổn pagoda is situated on Nguyễn Văn Trỗi Street, Ward 1, the prime location in the city center, so it is easy to move and convenient when traveling in Soc Trang. Ong Bon pagoda is also called A Côn – Hòa An Hội Quán pagoda and existed 130 years ago. 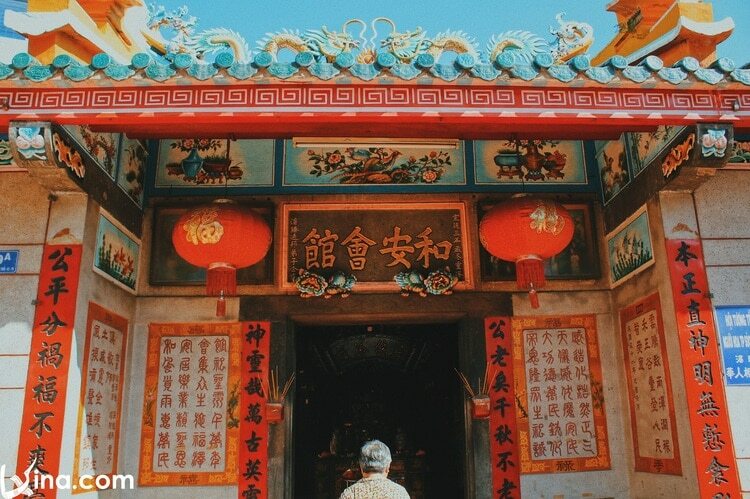 The temple is quite small, but it makes everyone admire its Oriental design style. Two red lanterns are hung on the main gate with a spiritual concept. Inside the temple, it makes people feel stunned with carefully sculpted statues. 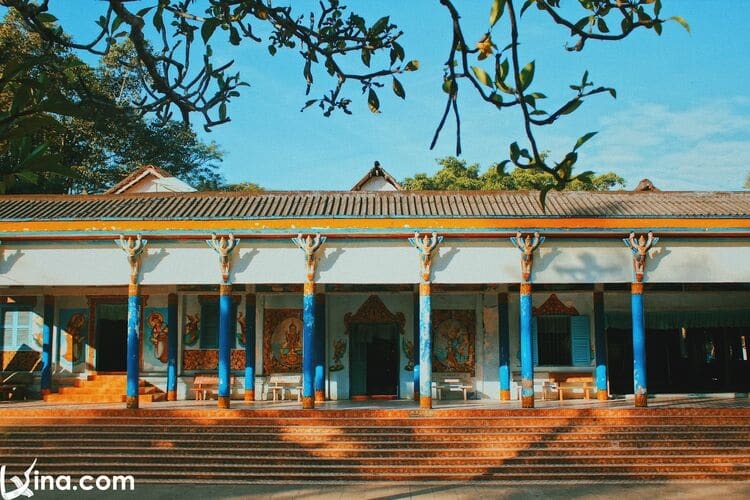 Ong Bon Pagoda is one of the ideal attractions to visit in Soc Trang. Phong Lan 2 Hotel – 133 Nguyen Chi Thanh: This hotel is a good place to stay and notable for its sauna and massage services. Phong Lan Hotel – 124 Dong Khoi: This hotel offers standard, comfortable rooms, managed by friendly professional staffs. Khanh Hung Hotel – 15 Tran Hung Dao: This hotel is perfectly located for both leisure and business guests in Soc Trang. It offers a high standard of service to suit the individual needs of all tourists. Hang Restaurant -No 2-Le Lai Street and Hiep Loi Restaurant- No 11 Cach Mang Thang 8 Street: These restaurants are popular local spots worth trying for Vietnamese food. Hung Restaurant – 24 Hung Vuong, Ward 6: It is perpetually popular, serving up delicious grilled fish and meat. 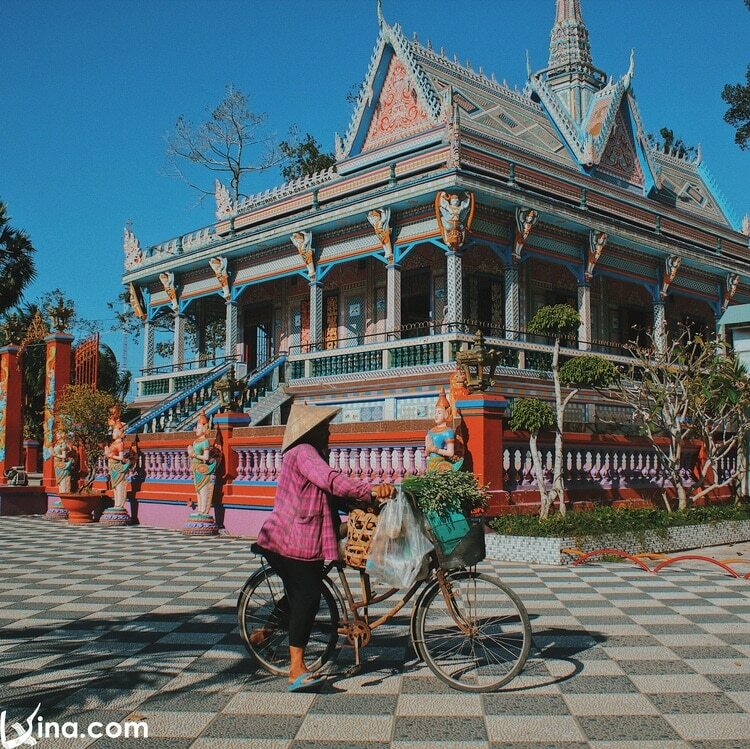 These famous pagodas in Soc Trang are the places where the city’s Buddhist nuns and monks perform ceremonies during the year. Hidden mysteries at these temples along with unique Khmer architecture have dragged tens of thousands of travelers each year. Are you ready for your trip to these pagodas in Soc Trang? You will feel your heart calm down and forget anxieties in your life. You can visit our Vina homepage to read more about our informative articles.